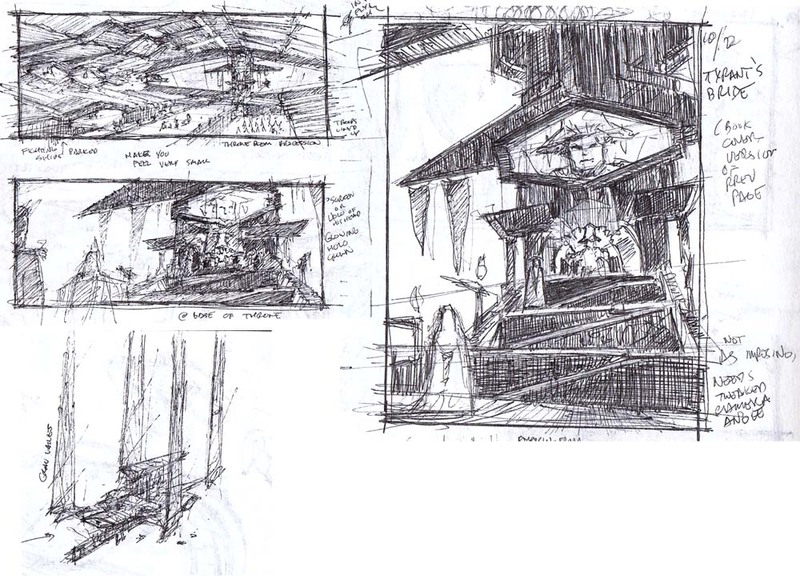 There's a closer view of the throne in both wide (film) and tall (book cover) versions, and then a little scribble of the giant sky fortress where the wedding is being held, in its docking bay. Next I scanned in the tiny sketch and placed it in an Illustrator file, scaled up to 11x17, where I did a pretty rigorous perspective layout. I'd meant to do more of the line work in Illustrator, but it was just taking too long, so I printed it out on 11x17 paper and hand-sketched the rest of it. Still feels better to use the pen - and it's far faster. And now I'm defining values in more detail and slowly painting out the line art, which I copied and flattened down onto the background at about 40% opacity (top image). I'm keeping my layer count small and so far doing all the painting on the Background layer. The background sky is a placeholder made from a photo, I'll paint over it to shape the clouds in a graphic arrangement that works better with the foreground elements. I have a pretty solid idea for color palette, but I'll be adding that very late in the process.